We rehearse on Monday evenings, 7:30 to 9:30 PM, beginning in January and continuing to the concert date. Our 2020 concert marks our 40th Anniversary making beautiful music together! Our rehearsal venue is the First United Methodist Church, One East Broad Street, Westfield, NJ. If you like to sing, learn, and enjoy the company of like-minded music makers, come sing with us! Join our community of 60+ singers–new members are always welcome (no audition required). For more information and a brief history of our group, you can download a printable pdf here. singerswestfield.org or call us at 908-656-7418. Think about joining us next year! Join us Monday evenings, 7:30 to 9:30 at the First United Methodist Church, One East Broad Street in Westfield, NJ when we begin rehearsals for our 2020 concert. New members are always welcome. 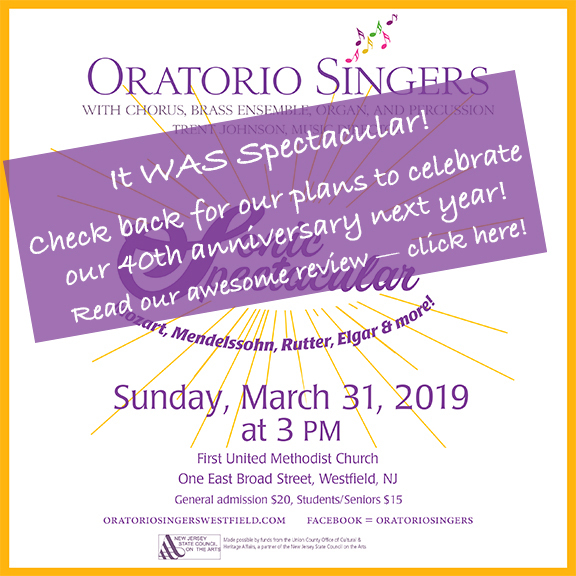 Oratorio Singers of Westfield is a non-profit 501(c)(3) organization and we depend soley on contributions, donations, and ticket sales to fund our concerts. To contribute to our performances and be listed in our next program, download our contribution form here. World class music close to home!